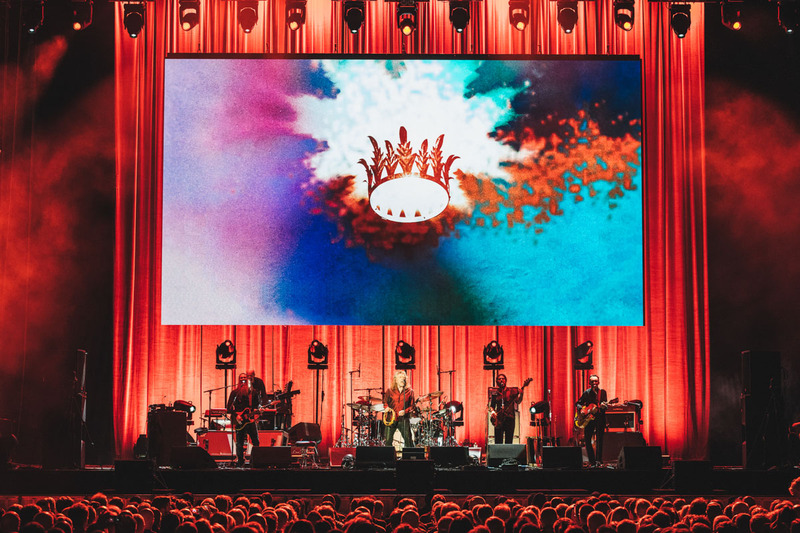 On a cold Friday night, the second day of BluesFest brought on stage two of the greatest British singers ever: Robert Plant and Van Morrison. 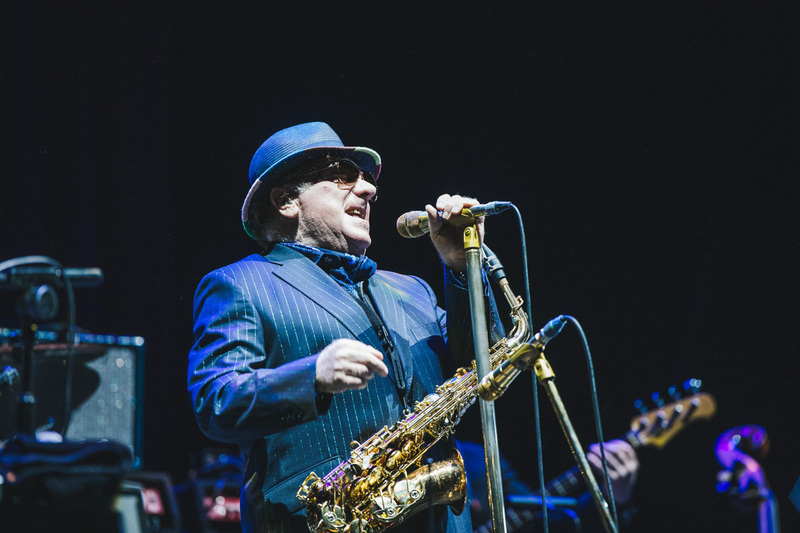 The two already played at the same edition of the festival in 2013, the year the festival was born, and Van Morrison must have liked it as he came back to play at BluesFest every year but in 2017. Opening the night is Colin Macleod, a Scottish musician who released just last year his first album, “Bloodline”; as Colin himself repeats a couple of times from the stage, the crowd of 20.000 has not come to the O2 Arena to see him, but nonetheless people seem to appreciate his music and he humbly thanks them many times before ending his show. After some minutes the stage is ready for Van Morrison, one of the two headliners of the night: even though he is playing before Plant, in fact, Van is co-headlining the concert and plays as much as the former Led Zeppelin singer. The Irish musician doesn’t waste a second as he and his band proceeded to play almost non-stop for an hour and a half: in his around 50 years of career Morrison released the astounding number of 39 albums so it would be difficult to represent them all, yet he manages to cover a big part of his discography tonight. From “Baby, Please Don’t Go” which he recorded in 1964 with his former band Them (coincidently featuring Jimmy Page on this song), to his classic “Moondance”, to “Broken Record” from his second last album, “Versatile”, released just last year. The whole setlist is focused on the more Jazzy and Bluesy side of Morrison’s music, and the performance is incredibly captivating: all the musician on stage get their time on the spotlights, and they all play with great taste, from the solos traded between the sax and the trumpet, to the guitar ones, to all the other instruments. As the last song – “Ballerina”, another old one – is coming to an end, the singer takes the microphone from its stand and finishes singing the last verses while walking off stage; the band keeps playing the coda and then follows Morrison while the crowd applauds them loudly. It’s now time for the second headliner of the night and, from the number of Led Zeppelin’s and Robert Plant’s t-shirts being worn in the Arena, it seems like most people are here for Plant. If someone was expecting it to be a nostalgia-filled concert, however, they might have been slightly disappointed: even though the O2 Arena has a strong relevance in the history of Led Zeppelin – here in 2007 they played their only full gig since the death of John Bonham – the singer didn’t stray away too much from the path he took in recent years. With “Lullaby and the Ceaseless Roar”, and maybe even more with the latest album “Carry Fire”, the singer explored different genres, Folk, Rhythm and Blues, a bit of Country too, venturing even into Middle Eastern sounds and some kind of tribal chants; so the band starts playing the first song – a Led Zeppelin classic, “Ramble On” – and introduces some new elements to it, partly rearranging it into a “Sensational Space Shifters” version with the violin replacing some parts that were originally played by the guitar. This new version, even though it’s different from the one all Zeppelin’s fan know and love, gives a pretty interesting new spin to the song and serves well to introduce today’s Robert Plant with a clear message: “Hey, I’m still Robert Plant, but I’m not just the former singer of Led Zeppelin”, he evolved, he added new sounds and influences to his music and he doesn’t refrain from showing it. And so, the concert starts, and continues with some songs from his two most recent records, great tracks such as “Turn it Up” and “The May Queen” and some other Led Zeppelin songs; in some cases, like with “Black Dog”, the songs are rearranged, some others are closer to their studio counterpart, like “The Rain Song”. The band works together well, with the musicians occasionally leaving each other some space to shine individually, whether it’s Justin Adams’ solo before “Carry Fire”, or Skin Tyson’s one on his acoustic guitar before a beautiful rendition of “Babe, I’m Gonna Leave You”, or any of the other players on stage; but, above everyone, stands of course Robert Plant. The singer abandoned the histrionic poses of his youth, moving on stage with a confidence and calm more appropriate to his age, and yet he sings amazingly showing how his voice almost hasn’t aged in 50 years. After an hour and a half the concert ends with Plant singing his lungs out to “Whole Lotta Love”, this one played faithfully to the original version, in front of an ecstatic audience which greets the band with a standing ovation. The second night of this year’s BluesFest brought together two of the greatest artists to come out of Great Britain, and they have proved once again their greatness.